Chlorine, a by-product from the electrolysis of chloroalkalis, was used in the beginning of the 20th century for the production of chloroorganic compounds and is known for its high reactivity with organics. Of the 114 organic priority pollutants listed by the United States Environmental Protection Agency (EPA) in 1975, 22 are chlorinated alkanes (Patterson 1985). Some of these are cited in Table 9.1. Because of their toxicity and tendency to bioaccumulate in animals, they must be removed as completely as possible from all liquid and gaseous effluents. Inspection of the compound properties listed in Table 9.1 (Wiesmann and Libra 1999) shows that, with increasing chlorine content, the Henry coefficient rises, whereas solubility and biodegradability show a reversed trend. Therefore, tri- and tetrachloroethene are normally air pollutants and are removed from water and air by activated carbon adsorption. The discussion here will concentrate on dichloromethane (DCM) and 1,2-dichloroethane (DCA). Table 9.1 Some chlorinated n-alkanes, their properties and uses (Patterson 1985). d) EPA list of organic pollutants (EPA 1975). LD50 of 0.167-2.4 g kg-1 live weight. The LD50 value gives the mass of the toxic compound per mass of the animal for which there is a 50% probability that the animal would die within a given time. Mutagenic effects in rats could not be proven (Jongen et al. 1978). Loew et al. (1984) and Rannug (1980) indicate that DCA may be carcinogenic. Data on the worldwide production of DCA during 1960-1981 show an increasing production from 93 ■ 1031 a-1 to 825 ■ 103 t a-1, however, production decreased in Germany from 137 ■ 1031 a-1 to 67 ■ 1031 a-1 in the 3-year period 1990-1993 (Herbst 1995). Study of the mechanism and the kinetics of DCM degradation began in the late 1970s. Studies of the catabolic reactions were first published by Leisinger (1988). The kinetic and stoichiometric coefficients are listed in Table 9.2. The variability of the values can be explained by the use of different methods for kinetic measurements and different microbial cultures. Some authors used pure cultures, some mixed. Table 9.2 Kinetic and stoichiometric coefficients for aerobic and anoxic degradation of DCM and DCE (Herbst 1995, expanded). Mixed culture 0.56 Acinetobacter sp. We can conclude from a mean KS value of 10 mg L-1 DCM that very low DCM concentrations below 1 mg L-1 can only be obtained by a physical or chemical second step, e.g. 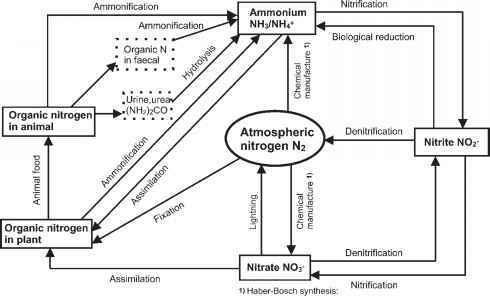 adsorption on activated carbon or ozonation. A hypothetic pathway for the catabolism of 1,2-dichloroethane oxidation was published by Janssen et al. (1985).